Calcium acts as a universal second messenger in a variety of cells. Numerous functions of all types of cells are regulated by Ca2+, thus calcium measurement is critical for various biological investigations. Fluo 8® and Cal-520®, both of which enable the high throughput screening of GPCR and calcium channel drug discovery targets through the convenient calcium detection. FLIPR® and FlexStation® instruments of Molecular Devices, FDSS®/μCELL of Hamamatsu and NOVOstar of BMG Technologies have further accelerated the high throughput measurement of calcium for GPCR and ion channel research. Fluorescent probes that show spectral responses upon binding Ca2+ have enabled researchers to investigate changes in intracellular free Ca2+ concentrations by using fluorescence microscopy, flow cytometry, fluorescence spectroscopy and fluorescence microplate readers. Most of these fluorescent indicators are derivatives of BAPTA chelators that incorporate a PET system responsive to calcium. There are quite a few factors that need be considered when selecting a fluorescent Ca2+ indicator. 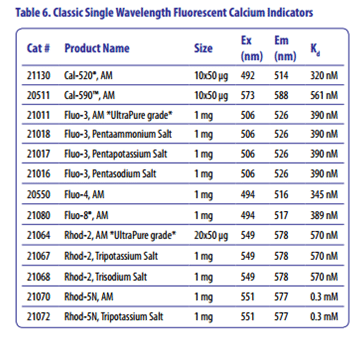 Among the visible light-excitable calcium indicators, Fluo-8®, Fluo-4, Fluo-3, Rhod-2 and Rhod-4™ are most commonly used. 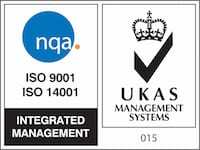 Fluo-8® indicators are widely used in flow cytometry and confocal. Among the visible light-excitable calcium indicators, Fluo-8®, Fluo-4, Fluo-3, Rhod-2 and Rhod-4™ are most commonly used. Fluo-8® indicators are widely used in flow cytometry and confocal laser-scanning microscopy. More recently, Fluo-8® AM has been extensively used for high throughput screening of GPCR targets. Fluo-8® is essentially nonfluorescent unless bound to Ca2+ and exhibits a quantum yield of ~0.15 in the presence of saturating Ca2+ and a Kd of 390 nM for Ca2+. Cal-520® is by far the best 488 nm-excitable green fluorescent calcium indicator with a significantly improved signal/background ratio and intracellular retention. The long-wavelength Rhod-4™, Cal-590™ and Cal-630™ are valuable alternative Ca2+ indicators to the green fluorescent Fluo-8®, Fluo-4 and Fluo-3 for experiments in cells and tissues that have high levels of autofluorescence. Rhod-5N has a lower binding affinity for Ca2+ than any other BAPTA-based indicator (Kd= ~320 µM) and is suitable for Ca2+ measurements from 10 µM to 1 mM. Like the parent Rhod-2 indicator, Rhod-5N is essentially nonfluorescent in the absence of divalent cations and exhibits strong fluorescence enhancement with no spectral shift upon binding Ca2+. Both Fluo and Rhod indicators are available as cell-impermeant potassium salts or as cell-permeant AM esters. l-520® dextran conjugates are the best choice due to their high fluorescence quantum yields and large fluorescence enhancement by calcium. 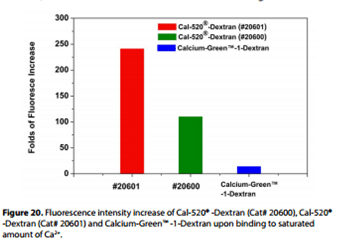 Compared with Oregon Green® BAPTA-1 dextran, Cal-520® dextran exhibits much lower background and much larger calcium-induced fluorescence enhancement. Among the fluorescent calcium indicator dextran conjugates, Cal-590™ & Cal-630™ dextran conjugates might be better choices than other red fluorescent dextran conjugates due to their higher fluorescence quantum yields and larger fluorescence enhancement by calcium. Cal Red™ R525/650 has been developed as a new 488 nm-excitable ratiometric fluorescence calcium indicator. Cal Red™ R525/650 is weakly fluorescent. Once it enters cells, the lipophilic AM blocking groups are cleaved by intracellular esterase, resulting in a negatively charged fluorescent dye retained well in cells with excitation close to 488 nm and two emissions at 525 nm and 650 nm. When cells are stimulated with a bioactive compound, the receptor initiates the release of intracellular calcium, which is chelated by Cal Red™ R525/650. The emission signal is increased at 525 nm and decreased at 650 nm when excited at 488 nm. 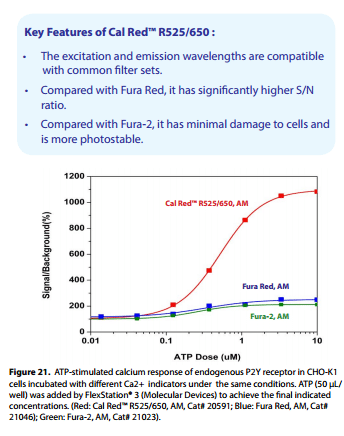 The excitation and emission wavelengths of Cal Red™ R525/650 are compatible with common filter sets and cause minimal damage to cells, making it a robust tool for evaluating and screening GPCR agonists and antagonists, as well as calcium channel targets. Fluo-3 and Fluo-4 are most commonly used among the visible light-excitable calcium indicators. Fluo-4 is an analog of Fluo-3 with the two chlorine substituents replaced by fluorines, which results in increased fluorescence excitation at 488 nm and consequently higher fluorescence signal levels. Cells may be loaded with the AM ester forms of these calcium indicators by adding the dissolved indicator directly to dishes containing cultured cells. AAT Bioquest offers Fluo-4 AM in the best quality with the best price. Fluo-3 AM and Fluo-4 AM are only moderately fluorescent in live cells upon esterase hydrolysis, and require harsh cell loading conditions to maximize their cellular calcium responses. Fluo-8® and Cal- 520® calcium dyes have been developed to improve cell loading and calcium response while maintaining the convenient Fluo-3 and Fluo-4 spectral wavelengths of maximum excitation @ ~490 nm and maximum emission @ ~520 nm.